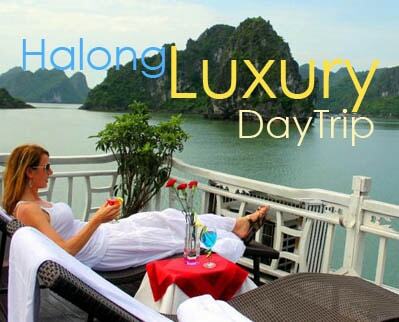 The poetic and beautiful Hue of Vietnam was chosen to be the capital of the Southern Kingdom under Nguyen Lords’ Dynasty, and officially became the nation’s capital under Tay Son Dynasty, King Quang Trung. The citadel palace complex is located on the North bank of Huong River (Perfume River), inside Hue city. 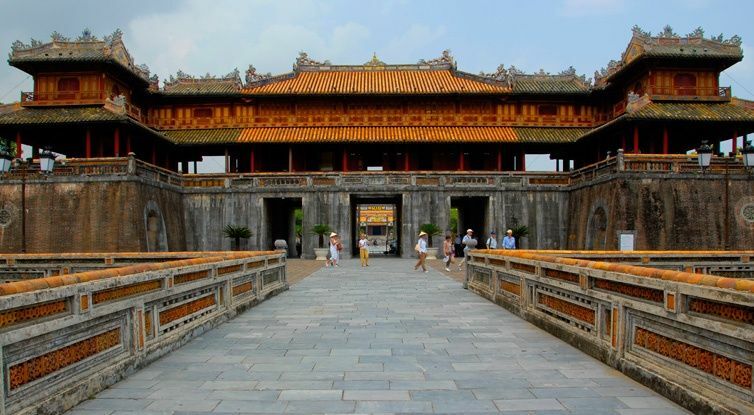 It is a huge complex covering an area of 520ha and comprising three circles of ramparts, Kinh Thanh Hue (Hue Capital Citadel), Hoang Thanh (Royal Citadel) and Tu Cam Thanh (Forbidden Citadel). It was said to be protected by the two sand dunes: The Con Hen and Con Da Vien on the Perfume River, as “dragon on the left, tiger on the right”. This citadel part was built with brick walls of 3.72m high, 0.72m thick, and about 1,230m in circumference. Its front and back sides are 324m long respectively, while the left and right sides are both more than 290m long. The whole site consists of 50 architectural constructions of different sizes and 7 gates for facilitating the entrance and exit. Dai Cung Mon (the Great Palace Gate) is in the front side, only reserved for the Kings. 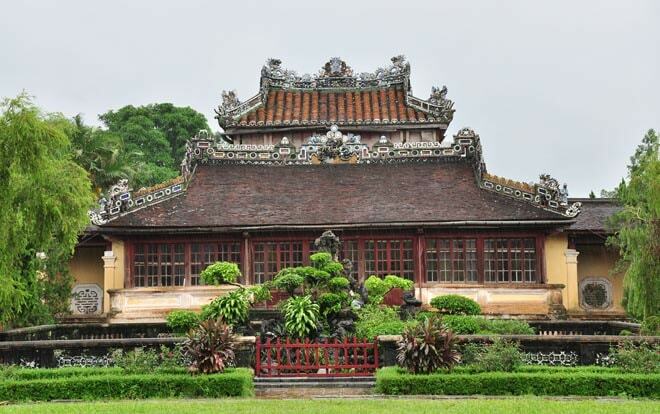 Can Chanh Palace was the place for daily working of Emperors. Can Thanh (Emperor’s Private Palace), Khon Thai Residence (Queen’s Private Apartment) were reserved for the Queens. There are still many other sections, for instance, Duyet Thi Duong house (Royal Theatre), Thuong Thien (the kitchen for the Kings’ food), Thai Binh Lau (King’s reading room), all of which are of great architectural value, luring uncountable visitors who are interested in feudal architecture. Standing for over 200 years and consisting of over 100 fascinating architectural works almost remained unchanged, the Royal Citadel is an ideal place for those wishing to better understand an architectural and cultural beauty as well as an important history of Vietnam. 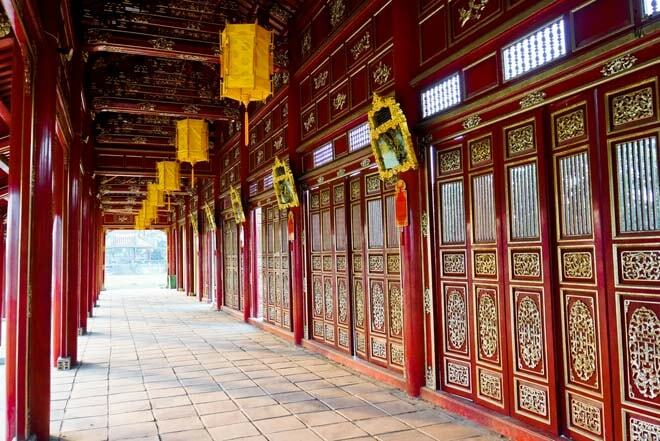 Joining a city tour of Hue and visiting Hue Citadel – the not-to-be-missed attraction when you travel to Hue will give you a better understanding of the architectural and cultural beauty during an important phase in Vietnam history.